Supergirl is still finding its feet. I remember when this episode first aired, I was still making up my mind about Supergirl. Rewatching it now, I can see why the episode didn’t sway me one way or the other. “Fight or Flight” is filler. Not bad filler, but filler nonetheless. It’s the clear product of a show trying to find itself, trying to differentiate itself from the umpteen other superhero shows on television right now but still saddled with the same old tropes of the genre. Early Supergirl featured a lot of girly stuff. I say that as a girl who is unapologetically into all things girly. 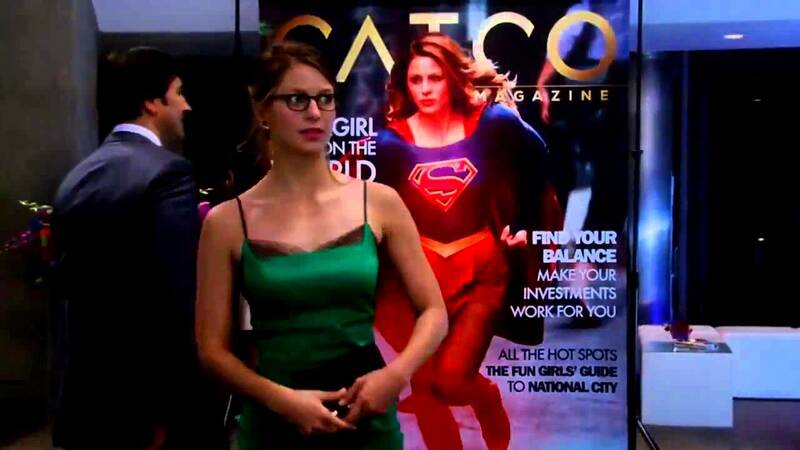 Still, even I groaned as Alex and Kara had a heartfelt conversation set to a “Girls Just Want to Have Fun” cover. Not to mention: we have a love triangle now. Or I guess love quadrangle. Love square? Winn loves Kara, Kara loves James, James loves Lucy. I could not care less. I seriously can’t stress how little I care about the romantic relationships on this show. Supergirl wants us to be behind James and Kara and I am in the whole “I wouldn’t mind it” way but it’s definitely not what keeps me tuning in. In fact, it’s one of the aspects of the show that almost persuaded me out of continuing to watch. I am sick of love triangles (and squares). Jenna Dewan-Tatum (Channing Tatum’s wife) is very good as Lucy Lane even if we only got a few seconds of her here. It makes me really curious to see this verse’s Lois. I know they’ve cast a Superman for season two, but is there any hint at a Lois? I would love to see the sisters interacting, it could be a very interesting mirror of Kara and Alex. Okay, on to the actual plot at hand. Kara is attacked by Reactron, depicted here as a weird discount Iron Man with a grudge against Superman and a desire to hurt all those close to his nemesis. Kara, fresh off the wounds of Cat Grant’s latest think piece, is determined to face Reactron herself without help from her cousin. James doesn’t think she can handle it and uses his watch to call Superman in. The fact that James was right to call Superman in this case gets remarkably little attention. Kara went in without a plan intent on hitting Reactron until he gave up. Kara is a precious dork and I adore her but girl, c’mon. You need to learn to think things through. The point of Kara’s identity crisis seems to be establishing why Superman won’t show up to help his little cousin every other episode. Kara wants to do things herself and stand on her own. Also, there’s some really confusing stuff where DC basically told the show they couldn’t use Superman because it would upset the DCEU. Then they decided “meh, never mind, it’s fine” which is why next season Supergirl will be getting Tyler Hoechlin. Kara and James prove that they’re made for each other because they’re both so terrible with secret identities. In the same episode, Kara accidentally reveals to Cat (and the world) that she and Superman are cousins and James lets Winn in on the Clark Kent is Superman secret. Cat entitles her article on Supergirl “Millennial Falcon,” a reference to the Millennium Falcon which was piloted by one Han Solo who bears a remarkable resemblance to Calista Flockhart’s real life husband. This episode sees the introduction of the super secret Supergirl office. As secret headquarters go, it’s not exceptionally memorable. It certainly doesn’t have anything on the Arrow Cave or Star Labs. Hank’s eyes glowed red again. I think it might be time to call the Winchesters. Forgettable villain, but some interesting identity issues. I think you're right that they were trying to address any possible cousin-envy and the Superman-can-show-up-and-fix-everything thing, and that they didn't do it very well. Although I did love them accidentally telling Winn that Clark Kent was Superman. Kara is far from perfect. Her plan to defeat Reactron, as you pointed out, was a stupid plan, and if it weren't for her two crack back-up teams at CatCo and the DEO, she probably would have died. Honestly, I didn't track all of the Harrison Ford in-jokes the first time through. :) Maybe I'll catch them this time now that I'm liking the show so much more. Hank’s eyes glowed red again. I think it might be time to call the Winchesters. Lol.